In 2001 thrash metal band PANIKA (Chelyabinsk, Russia) breaks up. 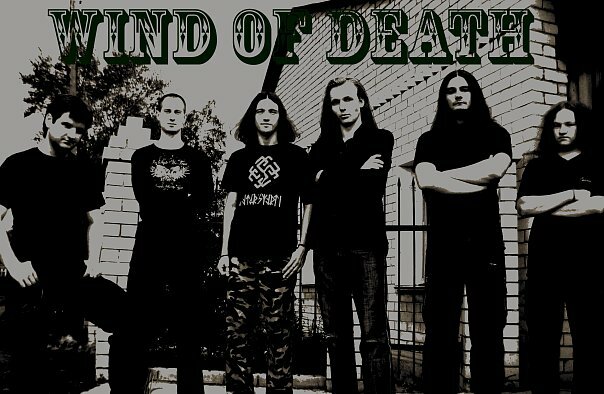 In 2003 two members of this band � Alexandr Buzdalin (drums) and Mikhail Pigin (vocals) together with Dmirty Zadorin (guitar) form WIND OF DEATH. At the early stage the band performs cover versions in search for its own identity. Soon the first song "The battle of Gods" based on the riffs by Dmirty Zadorin is composed. The lyrics of the song are dedicated to Slavonic paganism and WIND OF DEATH decides to play Slavonic pagan metal. There are two general directions in the music of the band: pagan metal and black metal. Band members were significantly influenced by the following groups: SEVERNIE VRATA (Northern Gates), BUTTERFLY TEMPLE, and, to a grater extent, NOKTURNAL MORTUM and the first album by ASHEN LIGHT. This is where the style of the band roots in. For a long time WIND OF DEATH exists only as an active concert band (generally in the Ural region) with no releases in its discography. Unstable line-up remains the main problem of the band: due to frequent line-up changes the composing and the recording of a debut album "A Song of the North" takes a long time. The recording process begins in 2012 in Dark Essence recording studio. In April of 2014 WIND OF DEATH supports BUTTERFLY TEMPLE. This show is followed by a significant line-up change: Dmirty Kozlov (guitar, backing vocals), Alexandr Korenovsky (bass) and Sandakov Aleksey (guitar) join the band in May, 2014. The recording of a debut is finished in October, 2014. Despite all past and future problems WIND OF DEATH remains active and composes new material.